Mending Wall Day is an annual event started in 2015 by our team here at American Stonecraft. 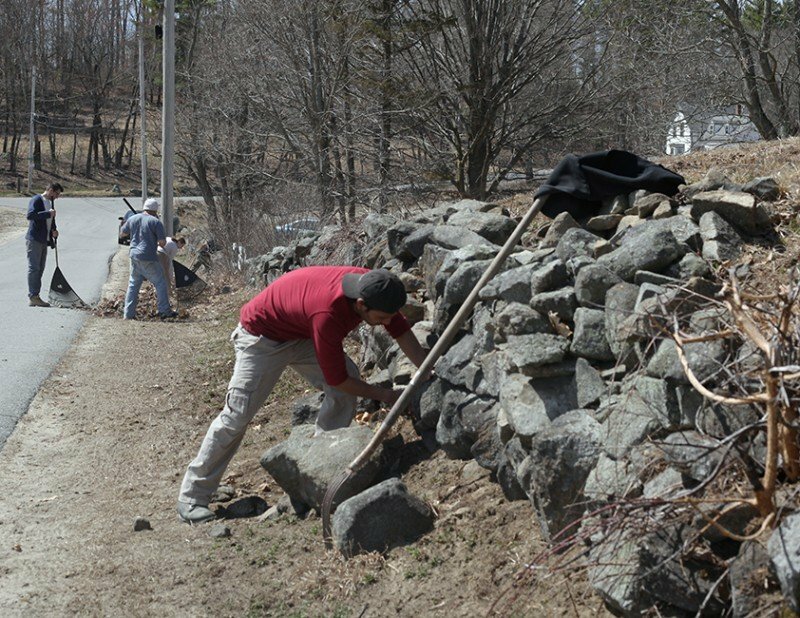 Our goal with Mending Wall Day is to increase cultural awareness of stonewalls by organizing independent community gatherings where neighbors and community members convene to rebuild and tend to fieldstone walls in visible public settings. Mending Wall Day is an opportunity to celebrate our rocky farmland, stonewalls, and community; all of which are defining characteristics of New England. It is a yearly community service project through which local community members repair and beautify stonewalls in the public domain. The event is named after Robert Frost’s poem Mending Wall, and much like the poem describes, we follow the New England springtime tradition of neighbors joining forces to mend their shared stonewall borders. The winter freeze and thaw cycle heaves the soil below the walls so that in the spring the walls need tending. As the event organizer, American Stonecraft is happy to announce our 2016 sponsor as the Boston Parks Department. A huge thank you to Paul Sutton (Program Manager for the BPD) for his assistance with this years event!! Along with our Studio in Lowell we also operate a small store at the new Boston Public Market. We are very excited that members of Boston Public Market community will also take part in this year’s Mending Wall Day. For Mending Wall Day 2016, we invite you to get out and enjoy the fresh spring air as you lend a hand to help clean up around the stonewall and complete light repairs to the wall along South Street in Boston, MA. We will meet at the intersection of South Street and Washington Street in Boston, MA at 10am. If you arrive later than 10am, please walk along the stonewall and you are bound to find our group! The closest T and Bus Transit stop is Forest Hills. If you are looking to participate in bringing supplies, we suggest: gloves, rakes, leaf/trash bags, traffic cones and bottled water. Older children are welcome however it is a potentially busy street so we will let you as the parents make that call. While RSVPs are not required, we would love to hear if you plan to come! We hope to see you there!! Please note: we’ve set the Rain Date for this event to April 23, 2016. In the case of inclement weather, we’ll update our Facebook page, Instagram account, and this blog post to let you know! If you have any questions leading up to the event you can call 978-464-1858 or email [email protected]americanstonecraft.com.